The debate over depictions of aboriginal culture in sport has shifted to south-central Saskatchewan. In February, the Western Hockey League's Moose Jaw Warriors announced plans to mark their 30th anniversary season by using a vintage jersey that, in the hometown Times-Herald's description, "featur[es] a cartoon Aboriginal figure wielding a tomahawk and a hockey stick — the logo the Warriors initially used when they moved to Moose Jaw from Winnipeg in 1984." With such a sensitive, multi-layered issue — not every use of aboriginal imagery is automatically offensive, although the Washington NFL team's moniker should be changed like yesterday — it seemed best to wait and see how it was being received locally. On Monday night, Moose Jaw's city council voted to send the team a letter asking it to reconsider its decision. The debate was renewed last month when Cree recording artist Buffy Sainte-Marie visited Moose Jaw and said the logo had to go.Barb Frazer, chairwoman of the Moose Jaw Cultural Diversity Advisory Committee, says the group is recommending that the logo be retired. She also says the team should consult aboriginal people and groups for direction and advice. “Buffy Sainte-Marie came into town and I was a little bit embarrassed that it took a cultural icon to really get us to bring awareness to this,” Frazer told city council Monday. Frazer said she has no problem with the current logo showing a chief wearing a headdress or with the team’s name. It's not as if the Western Hockey League club has descended to Dan Snyder levels of tone-deafness. Just days after the jersey was unveiled, as the Times-Herald noted, it sponsored a visit to Moose Jaw by Fred Sasakamoose, who was the first aboriginal player in NHL history and played junior in the city in the early 1950s. [Warriors GM Alan] Millar stressed the team won't be wearing the jersey for every game of the 2014-2015 WHL season. "This is something we're only going to wear on specific nights next year, and I don't imagine it will be worn more than six or eight times," he said. "We have nothing but respect for our First Nations people and we have always felt that the Warriors' name has been in respect of their heritage," added Millar. "(The jersey) has been about historical significance and the tradition of the team." But Frazer said "it represents a stereotype. The crux of Frazer's concern is that "the warriors in First Nations culture represent the best of our community. They are the ones who are first to step forward in times of need. … That character is totally insensitive, culturally, to the richness (of the culture)." The Warriors surely didn't mean to offend. It is vital, though, to make sure that honouring heritage and being inclusive does not cross the line into outright cultural appropriation. Don Marks' excellent documentary (and companion book of the same name) about aboriginal hockey players, They Call Me Chief: Warriors On Ice, elaborates on how team monikers such as Eagles and Warriors actually go over the line. 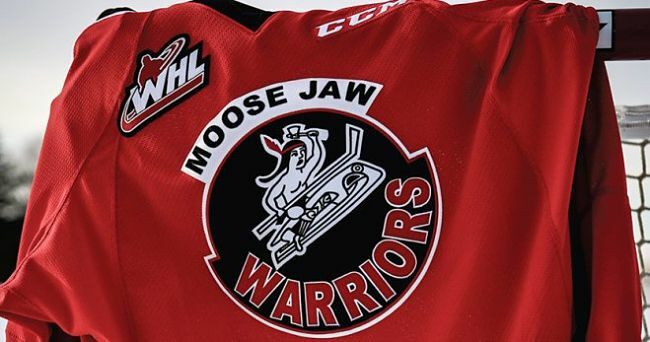 In this case, the concern in Moose Jaw is just over the dated logo. Sorry to be the answer to a question perhaps no one asked, but it seems odd to just revive the 1984-85 jersey when its logo wasn't unique to Moose Jaw. The club simply retained what was in use during the Winnipeg years. If it offends, then using it should be a deal-breaker, never mind "six or eight." Reasonable people can always find a reasonable solution, and one should have faith each interest can find a healthy medium. There's never going to be unanimity, but people can reach a level of understanding. There have been few instances in Canada of where organizing, either through the grassroots or on social media, has led to teams changing their name. In Ottawa, the Nepean Minor Football program is now using Eagles after musician Ian Campeau led a campaign to get it to eschew the name and colours of the Washington NFL teams. In southern Ontario, the Junior B Thorold Blackhawks might be close to retiring their cartoonish logo. Neate Sager is a writer for Yahoo! Canada Sports. Follow him on Twitter @neatebuzzthenet.